In general, the use of groundwater for drinking water supply is preferred, because groundwater is well protected. Surface water can be polluted by discharge of wastewater and accidents and water quality can change quickly. Groundwater is less vulnerable to pollution and the quality of groundwater changes only very slowly. Extracting groundwater for drinking water, however, affects groundwater levels in the area, and can thus have an impact on for instance agriculture and ecosystems depending on the groundwater level. Usually, climate change studies have paid attention to the impact on surface water and hardly to groundwater. However, climate change can affect groundwater resources too. It is hard to understand how groundwater systems work, because of their complex formation history. A lot of data is required to improve the understanding of these groundwater systems, but these data usually lack. However, in the Netherlands, we did study the groundwater system thoroughly, and we collected data since long. Therefore we now have extended data on soil characteristics and long time series of precipitation, temperature, and groundwater levels. We have used this knowledge to develop hydrogeological models. In our study, we used such a model to study the impact of climate change on possible adaptation strategies in the drinking water supply. In this research, we studied the Veluwe area. This slightly elevated area in the center of the Netherlands has a sandy aquifer with a large storage of well-preserved groundwater and has been a source of drinking water for centuries. Although the available amount of groundwater is abundant, there are unwanted effects of the extraction in some areas: especially when there are groundwater-dependent ecosystems close to the extraction, vegetation in these areas can suffer from the changes in the groundwater levels and/or seepage. A possible adaptation strategy to restore the groundwater system is to redistribute the extraction volumes from vulnerable areas to areas where the extraction affects the groundwater level less. The groundwater system of the Veluwe responds slowly. The groundwater levels are deep and surface water is only found at the edges of the area. Therefore the groundwater level hardly responds to the current weather. The fluctuations in groundwater level reflect the long-term precipitation fluctuations (Fig. 1, lower inset). This is different from the response at the edges of the Veluwe and most other parts of the Netherlands. Here the groundwater level is shallow and there are seepage zones and surface water systems. This is visible in how the groundwater level responds in this area: you can see the annual changes in the weather, with dry summers (and lower groundwater levels) and wet winters (and higher groundwater levels) in the upper inset in Figure 1. Thanks to the shallow groundwater levels along the edges of the Veluwe there was a drainage system developed of springs and brooks to be able to exploit watermills. In the 20th century, the use of water mills slowly ended and at the same time, the Dutch started to use these areas for extracting groundwater for the drinking water supply. 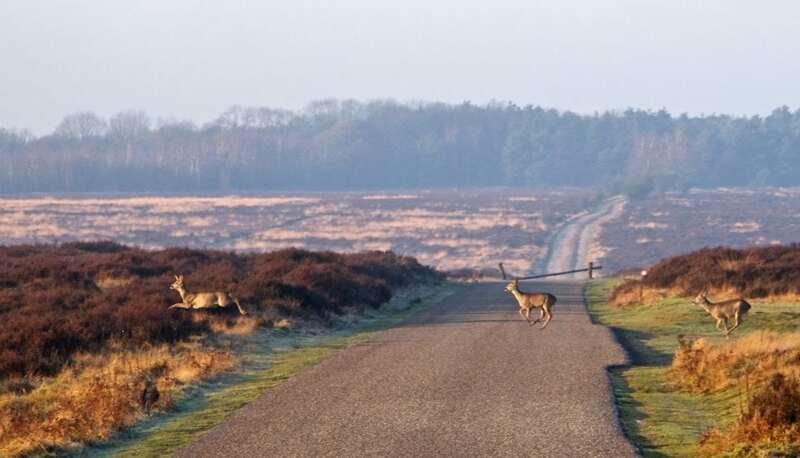 Because the Veluwe area is mainly covered with forest and heather, a large part of the annual precipitation disappears through evapotranspiration. The impact of the drinking water extraction in this area is approximately 8 % of the annual precipitation. The remaining precipitation infiltrates into the soil, and thus recharges the groundwater storage in the area. Although the impact of drinking water extraction to the Veluwe groundwater storage, in general, is relatively limited, locally there can be a considerable impact: because the drinking water extraction is mainly at the edges of the Veluwe, this sometimes interferes with the seepage areas and brooks and springs in these areas. For this reason, it is considered to redistribute the drinking water extraction volumes to less vulnerable parts of the Veluwe area. We used a hydrogeological model to calculate the impact of climate change and redistribution to the groundwater recharge and groundwater levels. 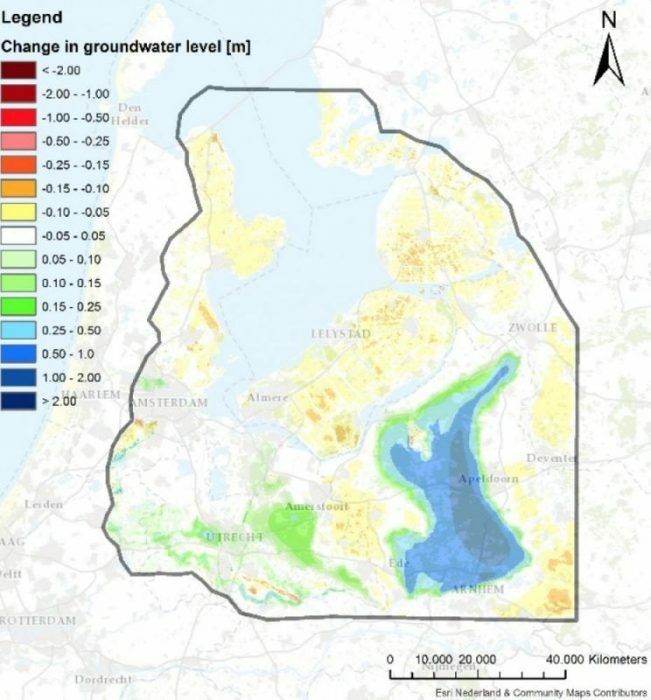 Although climate change will cause a lower groundwater level in most parts of the Netherlands, the results show that in the groundwater-driven Veluwe area climate change will cause the groundwater levels to increase (Fig. 2), which is a different response compared to the area surrounding the Veluwe: in this area there is a surface water system, which will drain the extra precipitation in winter, and the evapotranspiration will increase in summer. The combined effect is a decrease in groundwater levels. Our research confirmed that local hydrogeological characteristics determine to which extent the redistribution of extraction volumes affect the groundwater levels. We also found that the impact of climate change can be larger than the impact of redistribution. This is important to know. Moving a drinking water extraction plant is a societal expensive measure, and thus it is important to consider future developments and the impact before choosing this adaptation strategy. Next to these modeling results, also stakeholder opinions are important when choosing adaptation strategies., We will use the results of this study in a research project that studies how to improve the sustainability of drinking water extraction sites in the light of future developments. 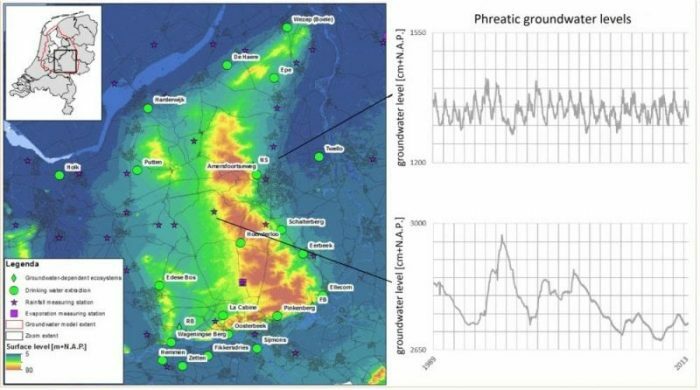 In the groundwater driven Veluwe area, increasing recharge of groundwater as a projected result of climate change could be considered a slightly positive side effect in the area. However, the overall threat of climate change to biodiversity goes way beyond this effect. This study, Impact of Changes in Groundwater Extractions and Climate Change on Groundwater-dependent Ecosystems in a Complex Hydrogeological Setting was recently published in the journal Water Resources Management. Jolijn Van Engelenburg currently works at Vitens, drinking water company in the Netherlands and part time at the Department of Earth System Science, Wageningen University & Research. Jolijn does research in Hydrology. Their most recent publication is 'Impact of Changes in Groundwater Extractions and Climate Change on Groundwater-Dependent Ecosystems in a Complex Hydrogeological Setting'.